We are amidst a revolution, as many aspects of our daily worlds are now translated into data. Moreover, data are essential to our media practices, feeding the applications of online platforms and the byproduct of our networked interactions. Not surprisingly then, data has become central to media research. This so-called datafication of society raises countless issues and creates challenges in politics, media production, civic participation and knowledge creation. This necessitates a new breed of critical thinkers able to assess the fundamental impact of datafication on society datafication. 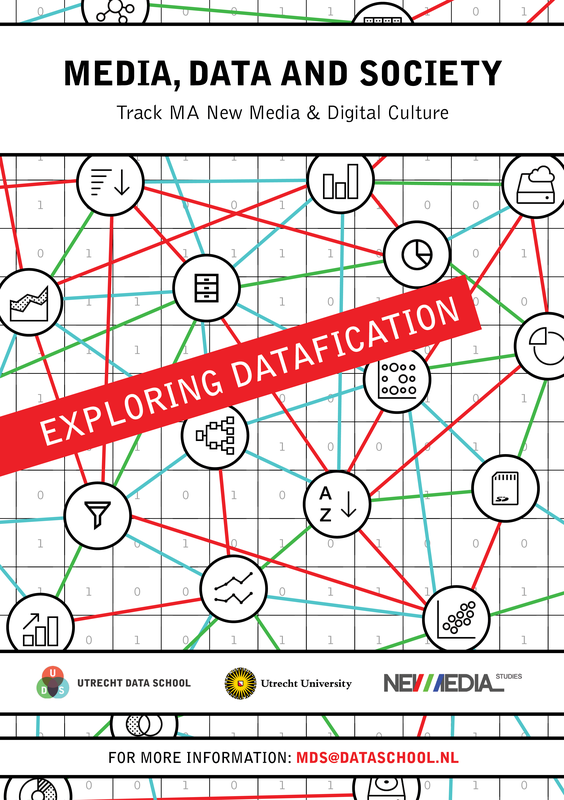 This ‘Media, Data & Society’ profile within the MA New Media & Digital Culture trains students not only as domain experts in media studies, but also in the skills needed for understanding datafication and applying data practices. In the end students of this profile will be able to critically assess technological developments, and perform basic data research. The courses in this profile tackle datafication from a unique combination of two perspectives: it teaches a humanities perspective to datafication and its impact, as well as familiarizing students with hands-on data skills like programming and data visualization. In addition, all students have to follow the courses New Media Theories, and the Ludification of Culture, a research internship and write a thesis. 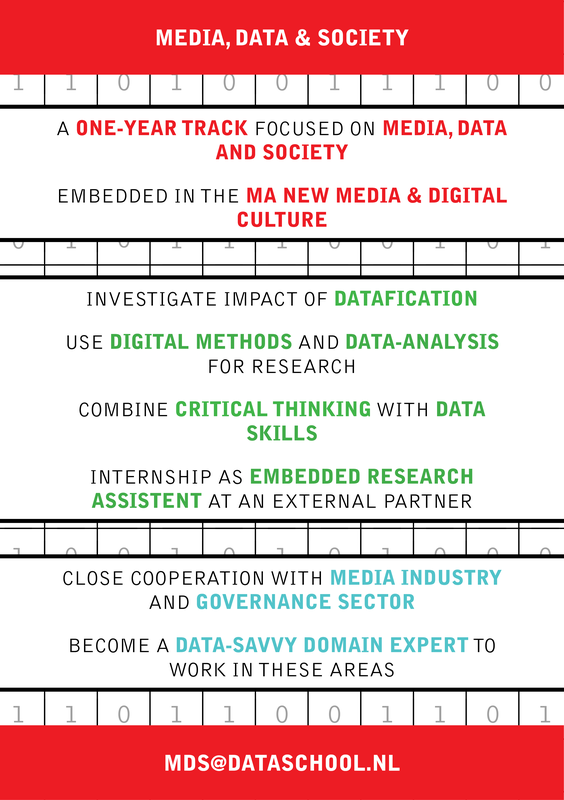 The Media, Data & Society profile offers students opportunity to gain in-depth data skills, that can be directly applied in a research internship and the thesis. Students of this profile will have additional lectures and training in data skills during term 3, in preparation for the thesis. Furthermore, co-partner of this profile, the Utrecht Data School, has a broad network with a wide variety of partners within the media and governance sector. Students are supported in finding an internship at one of our external partner organizations. Data profile students are supervised during their phase by Utrecht Data School staff. The profile Media, Data & Society does not educate students to becoming Data Scientists. There are excellent programs in the Netherlands that do just that. This profile answers to the growing demand of domain experts in media with a profound understanding of data practices. It expands understanding of (new) media, and information technologies in media industries, creative production and public management and trains students in addressing related data issues and applying data practices. Students will learn to connect producers and managers with data scientists, participate in technology impact assessment and policy making. New Media & Digital Culture, where the profile Media, Data and Society is part of, is a selective Master’s programme. Do you want to know if you are eligible for this Master? Check the entry requirements here. We are currently finalizing the details of the profile Media, Data and Society. If you have any questions you’d like to have answered in the meantime, please e-mail us at mds@dataschool.nl. Further information on the MA New Media & Digital Culture in general and the other profiles can be found here.